Elizabeth II (born 21 April 1926) is the first child of Prince Albert, Duke of York (later King George VI), and his wife, Elizabeth, Duchess of York (later Queen Elizabeth). On Wednesday, 6 February 1952, Princess Elizabeth received the news of her father, King George VI’s death and her own accession to the throne, while staying in a remote part of Kenya. The Coronation took place in Westminster Abbey on 2 June 1953. It was a solemn ceremony conducted by Dr Geoffrey Fisher, Archbishop of Canterbury. In winter 1953 Her Majesty set out to accomplish, as Queen, the commonwealth tour she had begun before the death of her father. With The Duke of Edinburgh, she visited Bermuda, Jamaica, Fiji, Tonga, New Zealand, Australia, Ceylon, Uganda, Malta and Gibraltar. Her Majesty Queen Elizabeth II visited Gibraltar during the 10th and 11th May 1954. HM Queen Elizabeth II is at present the world’s oldest reigning monarch as well as Britain’s longestlived and longest-reigning head of state. To celebrate such an important achievement, Gibraltar is issuing its first ever £10 stamp featuring a photograph by Sir Cecil Beaton (1904-1980) taken in 1955. 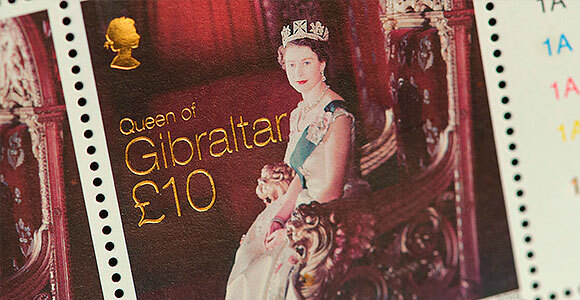 The stamps are printed with 22ct Gold and for the first time in history include ‘Queen of Gibraltar’ on a stamp. Long live the Queen!